An IVA or Individual Voluntary Arrangement is a formal debt solution that can help you deal with your unaffordable debts. In an IVA your debt repayments are usually lowered to an amount that you can afford to pay each month. In order to help explain how an IVA works, we have included some IVA Example cases below. We have provided a mix of both real IVA cases and sample IVA cases with varying debt levels, just so you have an idea of how an IVA might work for you. If you would like to know more about an IVA, please get in touch with us at McCambridge Duffy. If you want to know more about an IVA and if it might be a suitable solution for you, then fill in the form on this page or click the chat box and one of our IVA advisors will be able to discuss it further with you. Our client was struggling with monthly debt repayments of £785 to several creditors. We were able to have this reduced to £260 per month, with all interest and charges frozen. After 60 months of paying this reduced amount, any remaining debts will be written off and they will start their life free of debt. On completion of the IVA £15,600 will be repaid and £22,400 will be written off. Our client was paying over £920 per month on credit cards and loans totalling £33,000. We were able to have this reduced to £350 per month, with all interest and charges frozen. After 60 months of paying this reduced amount their IVA was complete, their remaining debt was written off and they were free of their debts. They repaid £21,000 and £12,000 was written off. A couple were paying over £700 per month on joint debts of £46,000. We were able to have this payment reduced to £300 per month, with all interest and charges frozen. After 8 months of paying this reduced sum, they proposed to remortgage their home. This was successful and they released £19,000. Their creditors accepted this amount as a full and final settlement of their debts. Our client was struggling with very high debt repayments of £1,550 per month which was far too unmanageable. After assessment of his situation we worked out what he could actually afford. We were able to negotiate payments of £440 per month with his creditors in an IVA. After 60 months, his remaining debts will be written off and he can start life free of debt. £26,400 will be repaid and £32,600 will be written off on completion. Our client was struggling with monthly debt repayments of £560 on debts totalling £19,000. We were able to have this reduced to £250 per month in an IVA, with all interest and charges frozen. After 60 months of paying this reduced amount she will become debt free and any remaining debt will be written off. £15,000 will be repaid and £4,000 will be written off. Our client was struggling with payments of £600 per month on all of their debts. We were able to reduce the payment to £240 per month. After 60 months of paying this reduced amount, any remaining debts will be written off and they will start their life free of debt. £14,400 will be repaid and £10,600 will be written off. Our client was struggling with monthly debt repayments of £500 on their credit cards, loans and catalogues. We were able to reduce the monthly repayments to a more affordable amount of £250 per month in an IVA. After 60 monthly payments, any remaining debts will be written off and they will be debt free. £15,000 will be repaid and £7,000 will be written off. Our client was struggling with monthly debt repayments of £1,141 to their creditors. We were able to have this reduced to £510 per month in an IVA which is more affordable for them. The IVA will last 60 months and on completion, any remaining debts will be written off and they will start their life free of debt. £30,600 will be repaid and £16,200 will be written off. A Self Employed client was struggling with debt repayments totalling £1,268 per month. We were able to have this reduced to £510 per month with an IVA. He immediately gained peace of mind that his business would be protected from any creditors. After 60 months of paying this reduced amount, he will be debt free and able to start afresh. £30,600 will be repaid and £52,400 will be written off. Our client was struggling with monthly debt repayments of £1,156 on debts totalling £47,000. We were able to have this reduced to £388 per monthwith an IVA. On completion of the IVA any remaining debts will be written off. £23,280 will be repaid and £23,720 will be written off. Our client was struggling with monthly debt repayments of £353 on debts totalling £17,674. We reduced this to £114 per month in an IVA. On completion of the IVA any remaining debts will be written off. £6,840 will be repaid and £10,834 will be written off. Our client was struggling with total debt repayments of £807 per month on debts totalling over £40,000. We were able to reduce the monthly payments to a more affordable amount of £248 per month in an IVA. On completion of the IVA £14,880 will be repaid and £25,487 will be written off. Our client could not afford their total debt repayments of £562 per month on debts of over £19,802. We were able to reduce the monthly payments to a more affordable amount of £187 per month in an IVA. When their IVA is finished they will have repaid £11,220 and the remaining £8,582 will be written off. Our client was struggling with total debt repayments of £455 per month on debts of £19,900. We were able to reduce the monthly payments to a more affordable amount of £200 per month in an IVA. On completion of the IVA £12,000 will be repaid and the remaining £7,900 will be written off. Our client was struggling with total debt repayments of £300 per month on debts of £20,750. We were able to reduce the monthly payments to a more affordable amount of £150 per month in an IVA. On completion of the IVA £9,000 will be repaid and the remaining £11,750 will be written off. Our client was struggling with total debt repayments of £565 per month on their credit cards, loans and overdraft. Their debts were amounting to £14,000. We were able to reduce their monthly payments to a more affordable amount of £180 per month in an IVA. On completion of the IVA £10,800 will be repaid and the remaining £3,200 will be written off. Our client was struggling with total debt repayments of £582 per month on their credit cards, loans and overdraft. His debts were amounting to £39,800. 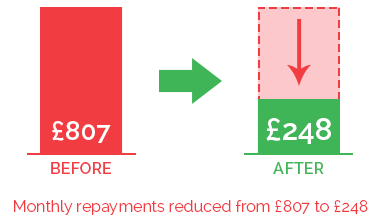 We were able to reduce his monthly payments to a more affordable amount of £208 per month in an IVA. On completion of the IVA £12,500 will be repaid and the remaining £27,300 will be written off. Our client was struggling with total debt repayments of £720 per month on her debts of £18,800. We were able to reduce her monthly payments to a more affordable amount of £150 per month in an IVA. On completion of the IVA £9,000 will be repaid and the remaining £9,800 will be written off. 1: We do not charge upfront fees for drafting and submitting your IVA Proposal. We only put an IVA case forward if we believe it will be a successful one for both you and your creditors. If however, in the event that your IVA proposal is unsuccessful, then you will not be charged a penny. 2: The fees for an IVA are all set by the creditors (no matter which provider you use), so if your IVA application is successful, the only thing to worry about is whether you have chosen the right Insolvency Practitioner. 3: All fees are taken out of your affordable monthly payment so you will never be asked for additional fees or receive a bill from us.